Let’s start with my Taiwan trip. I have never been to Taiwan before and visiting this country, which is quite different from my homeland, was by itself amazing. Lot of small shops everywhere, old and new temples between modern shopping centers, scooters everywhere, free WiFi in turistic places in Taipei… And friendly people everywhere. One really handy thing I noticed is that on every underground station, some buses and on few other places as well are recharging stations for your notebooks/cellphones. It is only starting to happen in my home town and in past I had several occasions when I could really use something like that. In Taipei, quite often you can see people recharging their devices so they can continue travelling 🙂 Other really interesting thing is kinda Foursquare predecessor. On plenty of places, you have a rubber stamp that you can use to put a mark in your log. On underground stations, all tourist offices, tourist attractions and more. So as you are travelling, you have a log of places you have been to. Really interesting comparing to all the high-tech stuff you see all around. I could go on how amazing Taiwan was from tourists point of view, but lets get to the main reason I was there – openSUSE Summit Asia. 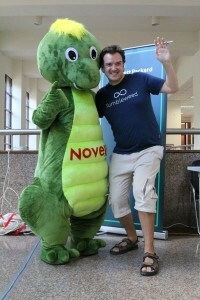 Everything started on Friday by openSUSE Leap release party. It was combined with Ubuntu party. Both communities mixed well together and it was obvious that they know each other well and are friends. As everywhere in Taiwan, everybody was really friendly. I met there guy from Canonical who had Ubuntu phone, I showed him my Jolla, he showed me his Ubuntu phone, we talked and I was giving it some thoughts. I was thinking about what to buy as my next phone as Jolla was in deep troubles back than. Luckily they are now out of the dark, so I can look forward to next Jolla phone, but Ubuntu phone is still interesting especially as it can be probably converted into openSUSE phone 🙂 There was some talking in Chinese by the host that everybody seemed to enjoy and then lightning talks. One Debian guy did a presentation of C web framework. After that I stepped up and did presentation of my favourite C++ web framework afterwards. We had some pizza, some local food, something to drink and even birthday celebration of one of the community members. It was a lot of fun. During the weekend was the summit itself. There was plenty of talks and workshops, some of it in Chinese, some of it in English. I did the keynote on behalf of openSUSE Board. Than I tried attending the Chinese workshop, but I got lost quite quickly, so I ended up following only the English part of the track. Regardless, there were some really interesting talks. One I would like to stress out is the talk that emphasises the importance of summit in Asia. There was a talk and long discussion regarding input methods. I found out that input methods varies a lot. Some uses English transcription, some maps keys on English keyboard to some Chinese signs, not sure whether full characters. But it varies a lot and it is not that easy to set it up. Now it is easier thanks to Chameleon tongue 🙂 And it is a type of problem, that is not that interesting in Europe/America, but is really important in Asia. Apart from talks, there was as on every conference a lot of talks in the corridor and connecting with people and making new friends. We even had a visit from lizardy mascot 🙂 I learned what to visit on Taiwan, where to buy stuff, how is the conference infrastructure setup, that there is ongoing effort to publish openSUSE Japanese magazine and much more. I was a lot of fun. As a proof of how much fun was it, you can take a look at the pictures taken during the conference.